Overview - Don Lee (Nick Cheung) is a police detective in Kowloon whose reliance on informants leaves him struggling with a guilty conscience. Lee’s previous stool pigeon had his cover blown and it left him paranoid and driven from his wife and home. Although he is beginning to doubt his own methods, Lee recruits a street racer named Ghost (Nicholas Tse) as his latest stool pigeon and assigns him to infiltrate a gang led by the notorious armed robber Barbarian (Lu Yi). Ghost accepts Lee’s offer so he can rescue his sister from a life of prostitution, as well as help his father’s one-million dollar debt. Ghost joins an illegal street race to gain acceptance into Barbarian’s gang. Lee also has personal problems of his own, as wife Cher (Miao Pu) whom he is separated from tried to commit suicide a few months previously and has since had amnesia. Lee begins to realize how wrong he was to exploit his informants and desperately tries to right his wrong before Ghost is in serious trouble. Influenced by the gritty and stylized sensibilities of film noir, director Dante Lam's 2010 action/thriller, 'The Stool Pigeon,' attempts to examine the complicated and precarious relationship between police officers and their informants. Taking clear inspiration from previous American and Hong Kong crime films, the movie weaves a tense and exciting narrative, that while fairly entertaining, does make a few unfortunate and notable stumbles along the way. The plot follows a straight-laced detective named Don Lee (Nick Cheung) as he enlists an illegal street racer called Ghost Jr. (Nicholas Tse) to be his new informant. Under Lee's orders, Ghost Jr. is charged with infiltrating a criminal gang in order to bring the organization down and imprison its leader, a thug who calls himself Barbarian (Yi Lu). Ghost Jr. effectively works his way into the group and becomes their driver, but as the pressures and dangers of playing both sides start to mount up, the kind-hearted "stool pigeon" must decide where his loyalties really lie. The script is a pretty basic amalgamation of many previous efforts from the genre, and while not terribly original, there is some decent character work and plotting present. The story shifts its focus between Lee and Ghost Jr. throughout, and both actors do a fine job in their roles. Lee is a by-the-book, stoic officer who hides deeper pain and anger behind his reliance on protocol. Though he seems to send Ghost Jr. into danger without concern, it gradually becomes evident through various subplots and interactions that he really does care. Lee's guilt becomes the driving force of the character's arc, and his ultimate journey toward possible redemption is the heart of the film's narrative. Ghost's storyline is also full of some emotional material, thanks to a romantic relationship that develops between the informant and Barbarian's girlfriend, Dee (Lunmei Kwai). The character's scenes are also home to most of the film's action and suspense, and the script features some effectively tense moments, including one particularly nail-biting sequence that sees one of the gang members pay a visit to Ghost during a meeting with detective Lee. Director Dante Lam does a solid job with the film's action scenes, and there are some exciting shootouts and car chases. The filmmaker brings a kinetic style to the screen that fuses some old school noir influences with more modern inspirations. Fight scenes can be extremely violent, and the movie is very brutal at times, displaying some strong but not quite excessive blood and gore in a heightened but still raw manner. A few car chases are particularly noteworthy, and one sequence, which sees Ghost Jr. and Dee trying to evade the cops, beautifully juxtaposes thrilling images of speeding cars with the serene melody of "White Christmas." A real highlight, this sequence showcases the director and film at its creative best, but unfortunately, few additional scenes reach that same height. Though there is a good amount to admire here, the film is not perfect, and there are some pretty glaring faults. Some of Lam's stylistic flourishes can seem a little unmotivated and clunky, with certain flashy camera movements and cuts coming across as superficial and unnecessary. Flashbacks to tragic events in Lee's life don't work very well either, and there are a few choices in both the past and present that become over-the-top and at times unintentionally humorous. In fact, most of the subplots involving Lee's guilt over his ex-wife and ex-informant don't really land as well as they should, and a few key dramatic scenes feel a little abrupt and forced. Ghost's initial motivations are also a bit undercooked and while we understand that he's doing this all for his sister, we don't ever really see enough of their relationship for it to make much of an impact. The seeds for emotional investment are planted for all of the characters, but none of it ever comes across as compelling as it should. 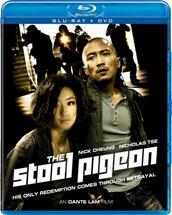 Well Go USA Entertainment presents 'The Stool Pigeon' in a Blu-ray/DVD Combo Pack. The set includes a BD-25 disc and a DVD all packaged in a standard case along with an insert advertising other releases. After some fast-forwardable but not outright skippable trailers, the disc transitions to a standard navigation menu. The movie is presented in a 1080p/AVC MPEG-4 transfer in the 2.35:1 aspect ratio. Featuring a heavily stylized, gritty appearance, the film looks pretty strong. The source is in good shape, with some light to moderate grain visible throughout, helping to give the movie a rough appearance. With that said, there are a few isolated moments where the grain doesn't seem to resolve fully, causing a very subtle smearing quality. For the most part, detail can be very strong, showing off the often bruised and beaten faces of the film's various characters. The movie's stylized cinematography and color palette favors blue and yellow hues but there is a great sense of depth and pop throughout. Black levels are deep and inky and contrast is intentionally high without overpowering the image. This is a pretty strong transfer that features a few particularly impressive sequences that offer some nice instances of fine detail and depth. Though there are a few very small technical hiccups and an occasional soft scene or two, the movie's intentional look is preserved well and shines through nicely on Blu-ray. The movie is provided with a Cantonese DTS-HD Master Audio 5.1 track, a Cantonese Dolby Digital 2.0 track, an English DTS-HD Master Audio 5.1 dub, and an English Dolby Digital 2.0 dub. Filled with several exciting action scenes, this is a powerful and lively mix. Dialogue is crisp and full with no signs of crackle or hissing. Directionality and surround use are very strong, creating a full and immersive soundscape full of whizzing bullets and crashing cars. The city's ambiance circles the environment, and though there are some fairly quiet stretches, when the action heats up the mix explodes with effects. Shootouts feature blazing guns and deep, thumping bass, and the various car chases litter the track with revving engines and screeching tires. Dynamic range is wide and comes through with strong fidelity, and the low end brings some nice rattle to the mix. Balance is handled well, and speech is prioritized nicely without sacrificing range and kick. 'The Stool Pigeon' sounds fantastic on Blu-ray, and this mix is full of great effects work and exciting aural design. Both subtle in its quieter moments, and pleasingly bombastic during action, the track offers everything you’d want out of a crime thriller. Well Go USA Entertainment has put together a somewhat slim but welcome collection of extras. All of the special features are presented in standard definition with Cantonese Dolby Digital 2.0 sound and English subtitles. It should be noted that in a potentially convenient or possibly inconvenient authoring choice, the next supplement in the menu will automatically play after the previous is done. Behind the Scenes (SD, 47 min) - This is a collection of raw behind-the-scenes footage recorded during and in between takes on-set. While there is some interesting material that focuses on the stunt work, complicated chase chases, and the director in action, a lot of this footage isn't very stimulating and about ten minutes is actually dedicated to one of the actors shaving his head. Still, it's a nice, refreshingly candid break from the usual promotional fluff that gets included on discs. Deleted Scenes (SD, 11 min) - Five deleted scenes are included and are only available to watch together. Most of this material is dedicated to more fleshed out back stories, including more with Lee and his previous informant and Ghost Jr. and his sister. Unfortunately, these additional sequences do little to alleviate my criticisms and were wisely cut for time. Making of (SD, 15 min) - This is a more traditional promotional piece about the making of the film that features cast and crew interviews with some behind-the-scenes footage. The participants discuss the film's cop/informant relationship, inspirations, characters, and casting. International Trailer A (HD, 1 min) - An international trailer for the film is included in 1080p. International Trailer B (HD, 1 min) - An additional international trailer for the film is included in 1080p. 'The Stool Pigeon' offers some exciting action and occasional thrills, but unfortunately, it suffers from some clunky scripting and over-the-top choices. Still, despite some flaws it remains a mostly entertaining and effectively tense ride. The video and audio presentations are both strong and supplements are pretty decent. This is a good disc for a solid film that is definitely worth a look.